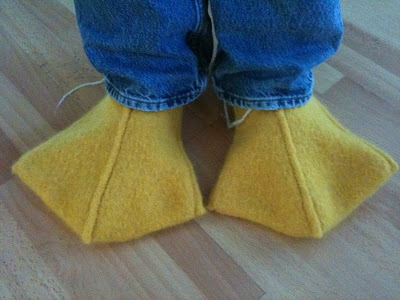 After three weeks or so of playing around with felt to figure out how it works, I finally am just about done with my duck slippers. I'm still working out the bugs in the pattern, but here's a preview of the finished product. The next post will have the complete pattern and detailed photos of the process. For those who don’t mind working without a lot of direction, here are the bare bones. For slippers: 2 skeins Cascade 220 yarn, color #7827, US #8 needles. For cuffs: 1 skein Cascade 220 Superwash, color #877, US #3 needles. crochet hook close in size to US #3 needles. Cast on and Round 1 same as Duck Socks. 6 sts. Repeat this round once. 14 sts. TCO 4 sts (2 wraps) at each end. 22 sts. TCO 6 sts (3 wraps) at each end. 34 sts. TCO 10 sts (5 wraps) at each end. 54 sts. TCO 16 sts (8 wraps) at each end. 86 sts. Work 1 round in pattern. still 86 sts. Place YO at each end (start with YO, work 1/2 of the round, then YO again). 88 sts. Work 1 round in pattern. still 88 sts. Decrease (2 top + 2 bottom) every 5th row 6 times. 64 sts. Decrease (2 top + 2 bottom) every 4th row 2 times. 56 sts. Change from working in the round to working back and forth. From here out, decrease on bottom only. Decrease (2 bottom) every 4th row another 3 times. 50 sts. Decrease (2 bottom) every 3rd row 5 times. 40 sts. Decrease (2 bottom) every other row 5 times. 30 sts. S2KP 3 central sts on bottom. 28 sts. Work toes and heel as you would for booby socks (i.e., center toe does not wrap around bottom). Pick up and knit a row of sts along the edge of opening with cotton yarn. On the second row, bind off. The bindoff does not need to be stretchy. After felt is done and dry, rip out cotton yarn along edge and pick up sts with superwash yarn, using crochet hook. Knit cuff as desired and bind off. I picked up a total of 92 sts, and reduced to 60 over 8 rows. When Cat talks, knitters listen. After my last post, Cat Bordhi chimed into the comments with a suggestion to try felting in the washing machine. 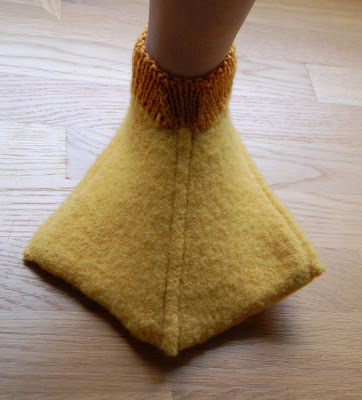 Apparently, my 12% / 25% shrinkage rate is less than one should expect from machine felting. Since this is my first felting project, the perspective of experienced people counts for a lot. So I took a break from slipper-making to run a few tests. But here's the rub: I have a front-loader, which is not great for felting. Still, I wanted to see what I'd get with the tools that were readily available. I made 4 identical swatches on size 8 needles (Cascade 220), and tried different ways of felting. Just for curiosity's sake, let’s take a look at the fabrics. Top row: felted in warm wash; felted by hand in hot water. Bottom row: felted in hot wash; not felted (control subject). This one turned out really uneven. Admittedly, this may be because it went in with a full load of laundry. This one turned out pretty even (this time I put it in with just a pair of jeans), but it really didn’t shrink all that much. 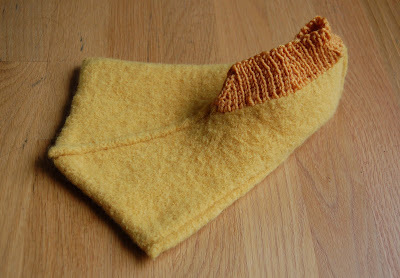 Notice how, in comparison to the other 2 felted swatches, this is the only one that really looks like felt. You don’t see the stitches like you do in the others. It feels a lot stiffer, too. The edges on this one are not as even as the machine-felted pieces, but a) I quite like the irregularities, and b) I bet you could even out the edges with a little fussing (stretching, blocking, whatever). Also, this is the only swatch that turned out completely flat. This is a big selling point with me.